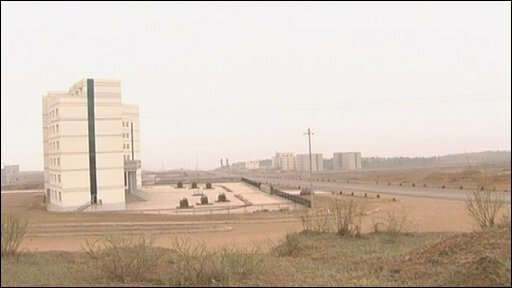 On a series of barren, wind-swept hills in China's Inner Mongolia, a new town stands half-finished and deserted. Several buildings have been completed; others are empty concrete shells, abandoned by workmen before their job was done. Wide boulevards stretch out in four directions, but there is little traffic. An occasional tractor potters along what should be busy streets. This was supposed to be a brand new town, but local leaders who planned it ran out of money long before it was finished. Thousands of local residents who were supposed to be enjoying new homes, offices and schools are still crammed into the old town. Many of them are angry at the waste of money - millions of dollars are already thought to have been spent on the scheme. 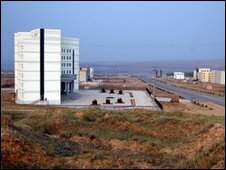 Details are sketchy, but the project, in the county of Qingshuihe, appears to have been thought up more than a decade ago. Local official Pan Lei told the BBC that county leaders had gone through the proper channels to get the scheme approved. "The leaders studied and researched this project," said Mr Pan, who works for the local publicity department. "Ordinary people should welcome it because it's been approved by the local parliament." He added that the county was one of the poorest in the country. 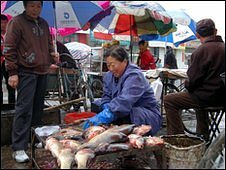 Its leaders had hoped the new town, positioned nearer the regional capital Hohhot, would attract investment and kick-start the local economy. It is unclear how much the entire scheme was going to cost, or how much has already been spent - the local government is reluctant to talk about the issue. Its own website reveals just how reticent officials are on this subject: the new town is not even listed as one of the county's main construction projects. Chinese media reports said the scheme would have cost more than $6b yuan ($880m, £610m) in total, many times more than the county government's annual expenditure. Qingshuihe was apparently not expecting to foot the entire bill, but local people are still angry at the waste of resources. One resident, Li Xianrong, said local leaders had sold land and businesses to fund the new town project. Now it had no money to spend on other things, such as social welfare programmes or sprucing up the shabby old town, added the 70-year-old. "This project has set the town back 10 years. We've even squandered the money we get from the regional and central government. People are very unhappy," said Mr Li. Others in this rural county seem to know little about the scheme and are resigned to the loss of so much money. "Why would the government talk to us about it?" said one woman when asked if she had been consulted about the new town plan. Mr Pan, the government official, said the project had not been abandoned and was only temporarily on hold. But the new town, which is more than 20km north of the old one, is currently deserted. Construction firms have even taken away some building materials to use on other projects. Caretaker Jing Wen, who watches over a half-finished hotel, said work began on the new town in 2005, but ended two years later - and nothing has happened since. "All the building work was for nothing," said Mr Jing, who added that he and his wife were the new town's only two residents. So how did Qingshuihe spend so much money on what is now nothing more than a ghost town? Officials in both Qingshuihe and Hohhot declined to discuss the issue in detail. According to media reports, the county did not run out of money - it seems it never had it in the first place. It expected the regional and national government to help with the cost of the new town. But Beijing never approved the plan, according to an official with the Hohhot city government, which is responsible for Qingshuihe. County leaders appear to have gone ahead anyway. Professor Joseph Cheng, of Hong Kong's City University, said China's county leaders often do what they like, unrestrained by either a powerless local population or a distant central government. "The communist party secretary is normally in charge - and there is very little oversight or checks and balances on their power," said Prof Cheng.